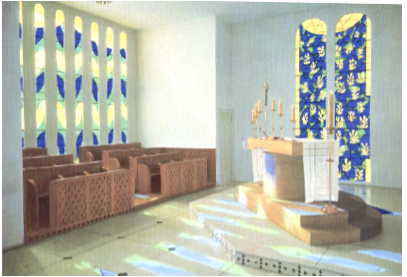 …when I made the Chapel…I wanted to inscribe…a spiritual space; that is, a space whose dimensions are not limited even by the existence of the objects represented. You must not say that I recreated space starting from the object when I ‘discovered’ the latter: I never left the object. The object is not interesting in itself. It’s the environment which creates the object. Thus I have worked all my life before the same objects which continue to give me the force of reality by engaging my spirit towards everything that these objects had gone through for me and with me… The object must act powerfully on the imagination; the artist’s feeling expressing itself through the object must make the object worthy of interest: it says only what it is made to say. There are many instances in Matisse’s mature and late works which clearly illustrate a sympathy for what we have now revealed through the quantum sciences: his work liberating colour from local narrative and defining colour as sensual, black as spiritual (acknowledging frequency and intonation), his use of handwriting and repetitious decoration, particularly in his artist’s illustrated books, continues a long path of Muslim and Eastern spiritual iconography in religious manuscripts and architectural decoration (acknowledging incantation and the use of decorative repetition to prepare for meditation, literally altering a person’s vibration). It used to annoy Matisse (who could exhibit a good sense of humour) to be called “Professor” by his friends. He insisted it was his glasses which were responsible for the nickname. Some people are just born teachers. This entry was posted on Wednesday, January 30th, 2019 at 19:41	and is filed under For Peace. You can follow any responses to this entry through the RSS 2.0 feed.